Willie Mullins landed the Weatherbys Champion Bumper for the seventh time when Champagne Fever took this year’s contest under the trainer’s son Patrick. “I’m delighted because we’d got a little despondent about how some of the horses had been running,” said the winning trainer. “The horse just gallops and has a huge cruising speed. That’s where we went wrong with him first time out at Leopardstown, we should have made more use of him. We always thought he was good but just messed up that day. At Fairyhouse we made all the running and I said to Patrick today to just be up there so he took it on himself to make the running.The horse seemed to go even better when he hit the rising ground. “I’m delighted for connections because Susannah Ricci has a lot of horses with me and a winner here is always fantastic but it’s even more special when it’s ridden by your son. Four years after recording his first victory in the Weatherbys Champion Bumper on Cousin Vinny, Patrick Mullins notched another success in the race aboard 16/1 shot Champagne Fever, who is trained by his father Willie. Patrick said: “I’ve always compared him to Quel Esprit, in that he has great cruising speed but not much of a finishing kick. He has a fine old stride so I wanted to use that and he showed that he was able to keep it up the whole way. “I wondered going round the home bend how much he had left but when the others came to me he just kept finding. He’s tough but a few people have questioned his head carriage. He carries his head up high but that’s just his posture. There was some bad news for the young jockey, however, after he was banned for two days, for exceeding the number of times he was allowed to use his whip by one. Declan Lavery, rider of fourth- placed Moscow Mannon, received a seven-day ban, also for excessive use of the whip. John Ferguson’s memorable first season as a permit-holder gained further gloss when New Year’s Eve finished second in the Weatherbys-sponsored Champion Bumper. Suffolk-based Ferguson employed Barry Geraghty for the ride on the four-year-old who split the Willie Mullins- trained pair Champagne Fever and Pique Sous, going down by one and a quarter lengths after the three pulled clear and had a sustained battle. Ferguson said: “I’m delighted with the way he’s run and he’s going to be a smashing horse for next year. 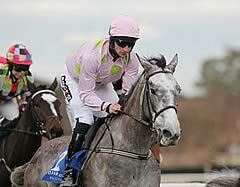 “He’s won two bumpers and to finish second in Cheltenham’s championship race is a great start to a horse’s career. He’s got the size and scope to go on and he’ll jump a hurdle in the autumn. 1. The first winner of the Weatherbys Champion Bumper in 1992 was Montelado, who achieved what is thought to be the unique feat of winning two consecutive Festival races. The Bumper, now run on Wednesday, was originally the last race of The Festival. Montelado went on to win the opening race of the The Festival in 1993, the William Hill Supreme Novices' Hurdle. 2. Irish-trained runners have a great record, accounting for 14 of the 19 winners. Willie Mullins has incredibly saddled six winners - he also rode his first winner of the race, the 1996 scorer Wither Or Which, while his son Patrick was in the saddle when Cousin Vinny won for the stable in 2008. 3. The five horses to have kept the trophy at home were Dato Star in 1995, Monsignor, who sprang a 50/1 surprise in 1999, Liberman, who gave Martin Pipe his first and only win in the race in 2003, Cue Card, who the 2010 renewal at odds of 40/1, and last year’s victor Cheltenian.